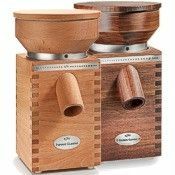 The WonderMill grain mill uses recently-developed "high speed microburst" milling technology that bursts grain kernels into flour. Stainless steel fins in the milling chamber impact the grain at extremely high speed, and the WonderMill's adjustment knob allows you to select your desired texture setting, from super fine flour to a coarser meal texture. 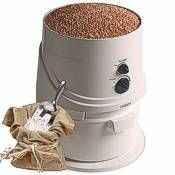 The WonderMill electric grain mill grinds at temperatures that preserve nutrients, ensuring that you'll always have the perfect flour for your food. 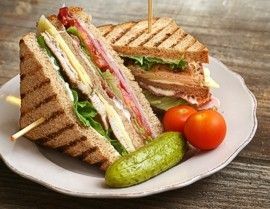 Imagine your favorite recipes made with the great taste and nutrition of 100% whole grain goodness—the WonderMill makes it possible! 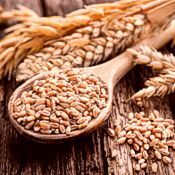 The WonderMill grinds wheat, rice, corn and small grains such as quinoa and amaranth, and also does an outstanding job of grinding beans and legumes. 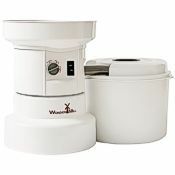 The WonderMill is great for making gluten-free flours such as brown rice, white rice, sorghum, quinoa, soy, millet, amaranth, bean, corn, chickpeas/garbanzos, and more. Chef Brad's Gluten-Free Rice Bread made with freshly ground brown rice flour works great using the WonderMill grain mill. Read the WonderMill grinding list here. With its 1250 watt motor, you can't buy a more powerful micronizing mill. 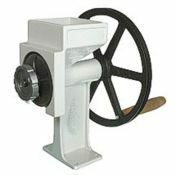 With its exceptionally strong motor, the WonderMill will grind over 100 pounds of flour per hour. Two fin-studded, precision stainless steel plates (pictured above) fit together, with the left plate rotating at thousands of RPM's. The WonderMill can easily be adjusted to grind fine, coarse, or anywhere in between. 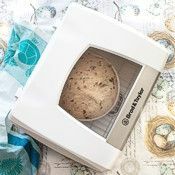 The WonderMill electric grain mill is extremely easy to use: Simply choose your grinding preference, fill the hopper, switch the machine on, and out comes your flour! There are no small parts or gaskets to misplace, and advancements in the Wonder Mill's design mean you can turn the mill off even while it's milling if you wish, then turn it back on to continue milling. After use, the WonderMill milling heads quickly and easily self-clean themselves, and they do a virtually dust-free job of it. If you'd like to freeze or transport flour, an optional flour bagger accessory even lets you grind straight into bags. 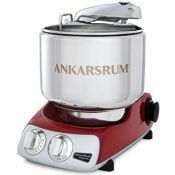 The flour bowl easily detaches from the milling assembly for easy storage. Hopper capacity is 8 cups; flour bowl capacity is 16 cups. 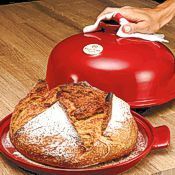 The flour bowl easily detaches from the milling assembly for easy storage. Our customers have been very pleased with their WonderMills, and we think you would be too—whether you're looking for a wheat grinder, a corn grinder, or a flour grinder for gluten-free grain. If you have questions about the WonderMill or any other milling-related topic you'd like to vist about, please give us a call. We'd be happy to help in any way we can, and we really look forward to serving you! 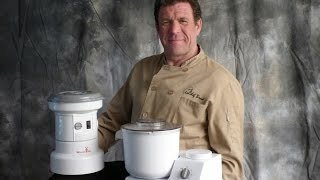 Click to see our electric grain mill comparison table. 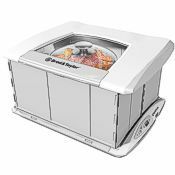 Pleasant Hill Grain offers many grain mill choices, both electric and hand-crank. 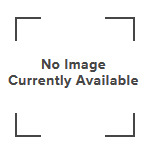 Click here to see all grain mills. I was shocked at how clean the grinding process was. Another mill we used we had to take outside because of the flour dust. This was fast, clean, and FUN! I love it! 22 out of 22 people found this review helpful. Did you? I bought this for making real, 100% whole wheat bread. 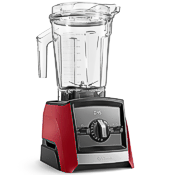 It works quickly, grinding three cups of wheat in about two minutes. The two parts will stack together and fit under our cabinets. It's rather noisy when it's on and grinding, but it's quick. Make sure you have the top of the receiving unit on tight and have the filter on, or you'll have flour all over the place. 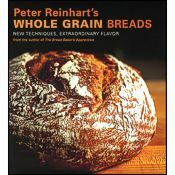 I recommend Peter Reinhart's "Whole Grain Breads," for great, two-day whole wheat recipes... fantastic, healthy bread. 18 out of 18 people found this review helpful. Did you? I bake for a living and wanted to mill my own flour with as little effort as possible. This is the easiest, least complicated piece of equipment I've found. It mills so fast and the finished product is amazing. For the price don't wait if you're considering purchasing the Wonder Mill. It mills beautiful flour that is healthy and nutritious. 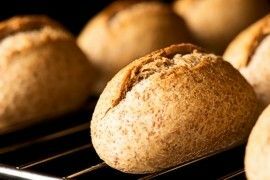 I used to grind grain with my Kitchen Aid heavy duty mixer with the grain grinding attachment and it worked fine for one loaf of whole wheat bread. I recently retired and decided to start making all our bread. My Kitchen Aid was overheating and I realized I was asking too much of it. I chose the WonderMill over the Nutrimill because it was said to have less mess. 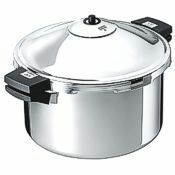 It's SO fast and quiet compared to mu Kitchen Aid. I'm sorry I didn't make the investment years ago. Well worth the spend! After 30 plus years, our old Magic Mill finally gave out. It also pulverized grain instead of grinding just like our new WonderMill, except the WonderMill is faster, quieter, and it does not spread flour around the working area. We inadvertently over-filled input hopper thereby over-filling the receiving container and forcing us to turn off the mill while there was still grain in the hopper. The instructions clearly warn against doing this. It trips the little breaker on the bottom. But by following the vendor's instructions in emptying hopper and resetting the breaker, everything worked as it should. 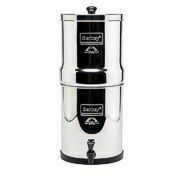 To avoid over-filling the receiving container, I suggest emptying the receiving container after grinding six or seven cups of hard grains, which is the amount that can be ground in under 3 minutes. Best mill for the price! I love my Wondermill! I use it multiple times during the week. Mainly for grains for breads and pastry, but I have also used it to make bean flour to use as a thickener. 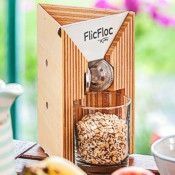 The mill works beautifully, is easy to use and doesn't take up too much space on the counter. I definitely recommend it! The WonderMill is a great product not only in price but in quality. Your sales personnel are friendly and helpful. I had a few questions and they did the research and got back with me with all the answers. Thanks for all your help. We bought the mill so that children in our Sunday School could mill wheat to use in baking communion bread. It has worked well with kids and adults using it. Easy to setup and run. 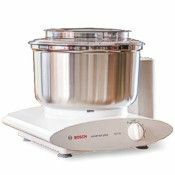 Mills super fast and is easy to set up use and then clean! I found that I do need to freeze my grain first or the flour comes out pretty warm and it is pretty loud. BUT, I wouldn't trade it! LOVE it!